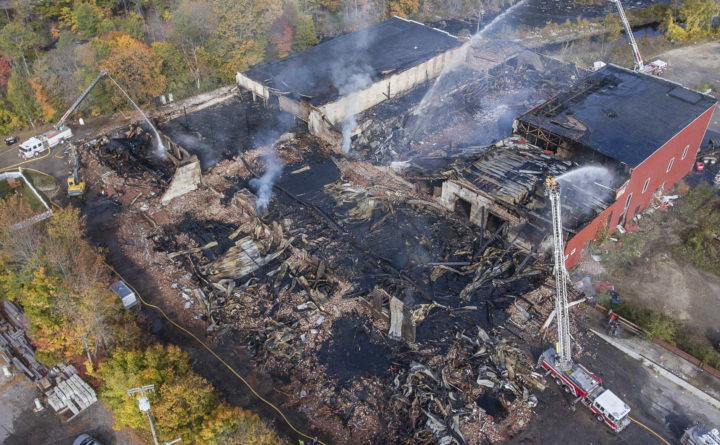 An aerial view Monday morning shows the fire scene in Mechanic Falls where a massive fire destroyed a historic mill on Sunday. The complex served several businesses, including as a warehouse for Maine Cycle, and was filled with motorcycles and parts. Corcoran Environmental Services, which recycles plastics, also operated at the mill. Crews are still fighting flames days after a massive fire in Mechanic Falls. As the fire raged, complete sections of the building collapsed, destroying entire businesses, apartments and hundreds of stored items. With fire crews still working to put out hotspots, families who called the old mill property home are trying to determine what — if anything — can be salvaged. Morgan Hackett and her husband recently moved and were storing almost everything inside the mill. “Usually this place is full with boats and campers. I don’t know what was in there when it went up in flames,” Hackett said. The mill, which dates back to the mid-1800s, has been a feature in Mechanic Falls for decades. “Almost everyone who lived in this town has a relative or knows someone who worked at the mill,” said Erick Peterson, with the Mechanic Falls Historical Society. Once a thriving paper mill, it closed in the late 1970s and has survived two other fires, but Sunday’s blaze destroyed it. “It’s still a treasure. I think in some respects what that property represents to the town,” Peterson said. While it’s still too early to tell what’s next for the mill site, for those who lost so much in the fire, they say they’re thankful no one was significantly hurt. “We are good though. Still have a roof over our head. Just lost a lot of replaceable things and a lot of non-replaceable things. Just trying not to think about it,” Hackett said.